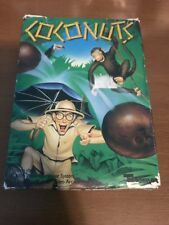 Coconuts by Telesys, 1982 (Atari 2600) Complete In Box CIB Tested & Works! ATARI 2600~AIR-SEA BATTLE~SCARCE!! VERY-GOOD COND~WORKS & PLAYS GREAT~LOOK!!! Atari 2600 AMIDAR and REACTOR-(1982)-Tested and Working. Beat 'Em & Eat 'Em - Mystique (Atari 2600) Cartridge Only w/ Case FREE SHIPPING! Combat (Atari 2600, 1977) COMPLETE in Box!!!! Battle On!!!! 6 product ratings - Combat (Atari 2600, 1977) COMPLETE in Box!!!! Battle On!!! !